Flat Dies: These are plain flat dies with square corners. 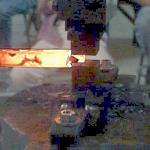 This is a multi-use die pair and generally required tooling. 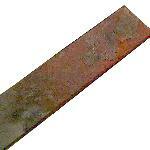 Together these are used for forging flats, tennons and texturing. The bottom die can also be used as a riser block for standard clapper (spring) dies such as made by Off-Center Tools and sold by Kayne and Son. 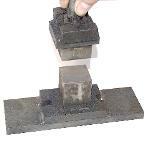 The top can be used with other bottom dies where the top simply needs to be a flat surface. 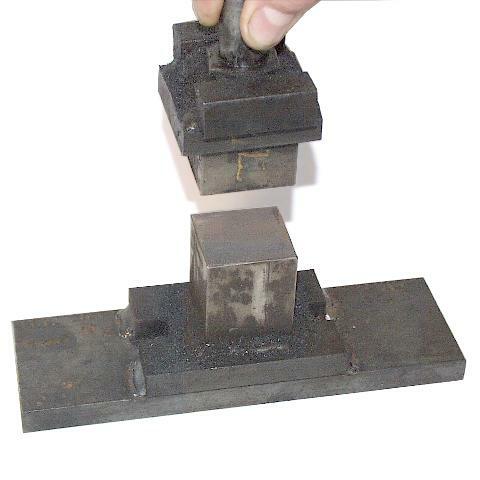 Russell O'Dell demonstrated making a flat aged or slightly pitted surface by sprinkling forge scale on a piece of hot iron and pressing it into the surface with the flat dies. 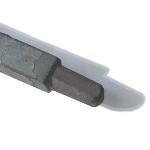 The top flat die is usualy made from one piece with a turned shank if a lathe is available. It can be round or square as shown.